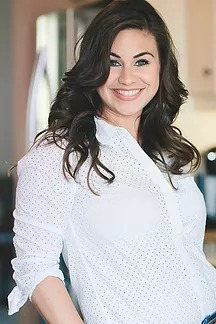 When the holiday marathon begins to pick up steam and rolls through town, many of us moms are left with no choice than to move that shifter into overdrive and put the pedal to the metal. It’s party time…quite literally. So many parties, so many school programs…so little time. It can be tough to keep up. As much as we’d all like to be crowned “Mom of the Year,” there are years we can’t Betty Crocker every single function. For sanity-sake, sometimes the June Cleaver in us just needs to take a backseat and let the modern-day momma drive. Even though we’re on track to cut ourselves a little more slack this holiday season, it doesn’t mean we can’t still create fun and festive treats in the kitchen with our kiddos this Halloween. 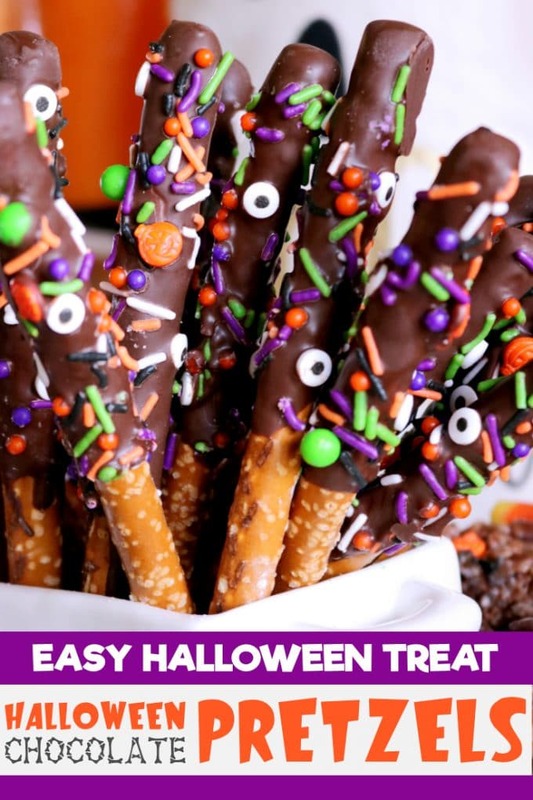 Chocolate-dipped Halloween pretzels will allow you to get into the kitchen and get out quick, without even having to turn on the oven. Instead, they’re made easy via the use of melting chocolate wafers, not to be confused with chocolate chips. The wafers melt down easy and smooth, with no tempering required. If you’ve ever worked with real chocolate, you know what a treat this is. Chocolate can be extremely temperamental, seizing up without any given notice, and candy wafers are far less finicky. You will find melting them down for dipping is quick and easy work. From there, it’s a simple matter of dipping the pretzel rods and allowing the children to go crazy with the sprinkles. Once the chocolate is melted, I found the easiest way to get a decent amount of coverage on these Halloween pretzels was to transfer the melted chocolate to a sturdy champagne flute. If you don’t have one, you would just need to take a look around your kitchen for a somewhat tall and slender (and food-safe) container. From there you would simply dip your Halloween pretzels in the chocolate, and shake off as much excess chocolate as possible, allowing it to fall back into the vessel. You should have a large sheet of wax paper ready at this point. You would then take the un-dipped side of the pretzel rod and gently tap it on the wax paper, allowing the chocolate to drape down the sides of the pretzel. Now, time for the fun part — the sprinkles. When it comes to decorating chocolate-dipped confections, avoid standard sprinkles, as they won’t show up very well — especially if you’re using dark chocolate. The best decoration for chocolate covered treats are jimmies (they are skinny and look like miniature candy tubes) and nonpareils (tiny, little candy balls). Because these are Halloween pretzels, I also used small candy eyeballs, which gave them a slightly monster-y/worm-y look. And, I have to admit, I think the eyeballs are pretty essential to the look of this spooky, kid-friendly dessert. 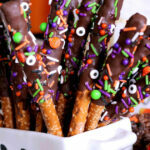 Be sure and allow time for the chocolate on your Halloween pretzel treats to set. Melting the chocolate, dipping the Halloween pretzels and throwing on some sprinkles takes no time at all, however, you will need at least an hour for the chocolate to completely set on these bad boys. So busy moms, this one is for you. If you can melt butter, you can make this super easy, super fast Halloween treat. These Halloween pretzel treats are undeniably festive and pret-ty darn tasty too. The perfect addition to any Halloween party! 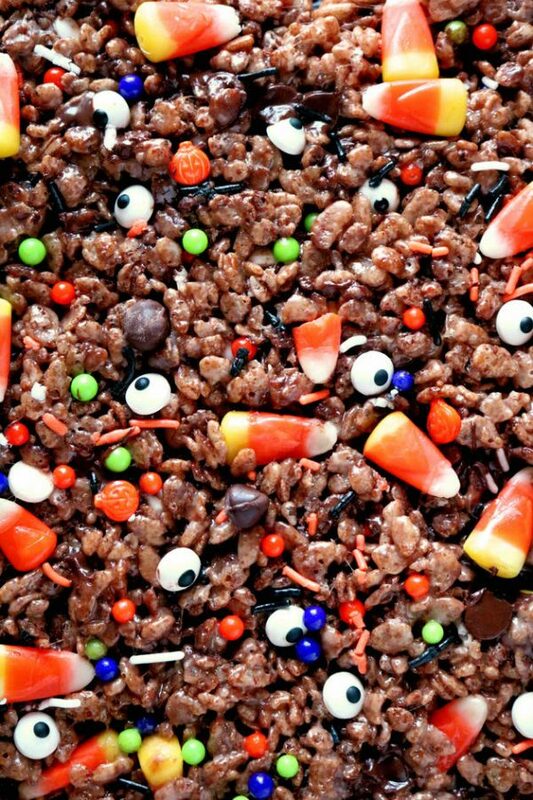 And, if you’re looking for more festive Halloween treats to add to the lineup, try these Halloween Cocoa Krispie Treats, perfect for class parties and cooking with little ones! 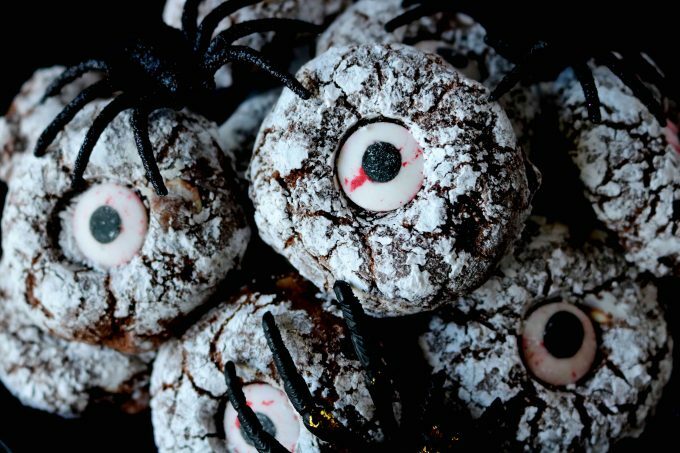 Chocolate Cyclops Crinkle Cookies are chewy, brownie-like Halloween cookies with a bloodied eye decal smack-dab in the center. They look horrible. Taste amazing. 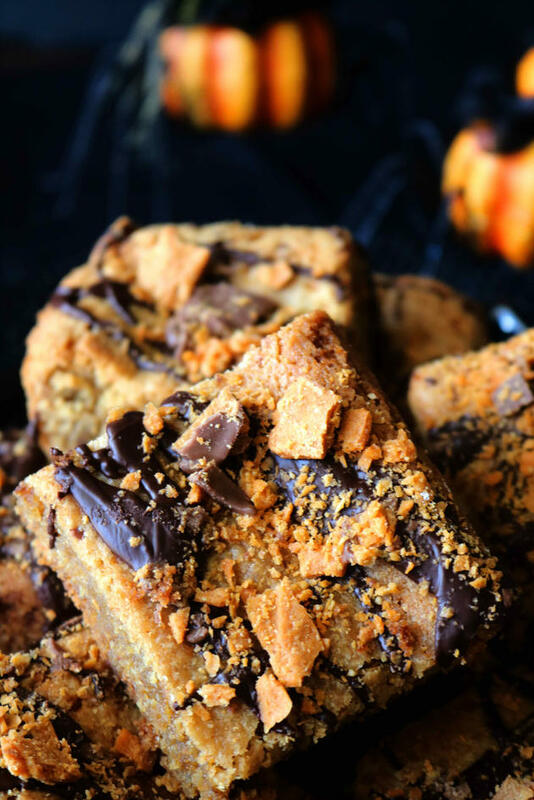 Halloween Blondies are a peanut butter blondie, topped with a drizzle of dark chocolate and a sprinkle of crushed Butterfinger. The contrast of orange and the dark chocolate put off some seriously delicious and spooky vibes. Halloween Pretzels dipped in melted chocolate and sprinkled with festive Halloween eye decals, jimmies, and more! Have ready a large work surface lined with wax paper. Combine jimmies, nonpareils and candy eye decals in a small bowl and set aside. Melt the chocolate wafers according to package instructions, and transfer to a tall and slender (food-safe) container. Dip each pretzel in the chocolate, shaking off as much excess chocolate as possible. Take the un-dipped side of the pretzel rod and gently tap it on the wax paper, allowing the chocolate to drape down the sides of the pretzel. Sprinkle the chocolate dipped pretzel with decals and set on the wax paper to set. Allow to set for about 1 hour. Once the chocolate is firm to the touch, serve and enjoy. Makes 20 Halloween Pretzel Rod Worms. Can’t believe Halloween will be here soon. These treats will come handy soon. I’m a school teacher so this would be a huge hit in my kindergarten class! These are so fun! They’re perfect for Halloween parties at school. Yum! Halloween is my favorite! I think I get more excited by it than any other day. 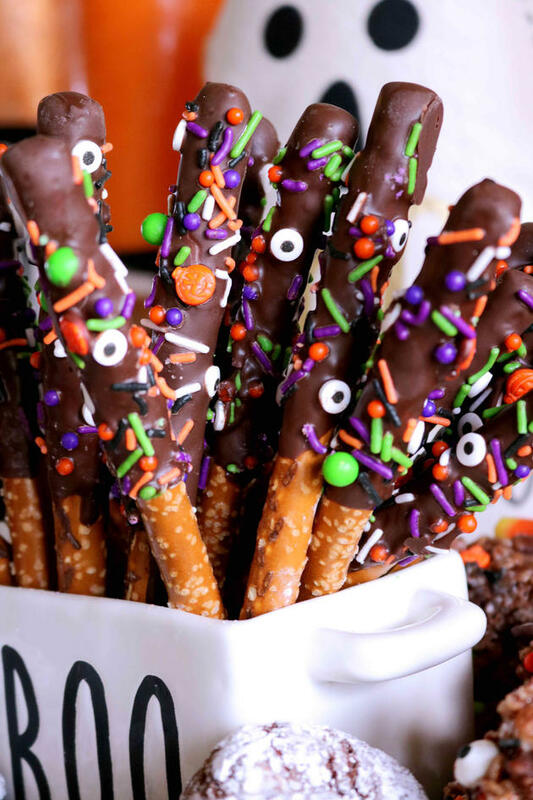 This Halloween Pretzel treats will be perfect to make for the kids. How is it almost Halloween time? This went flying by. But, gosh, these pretzels are cute! My kids would totally love these! And those blondies are calling my name too!